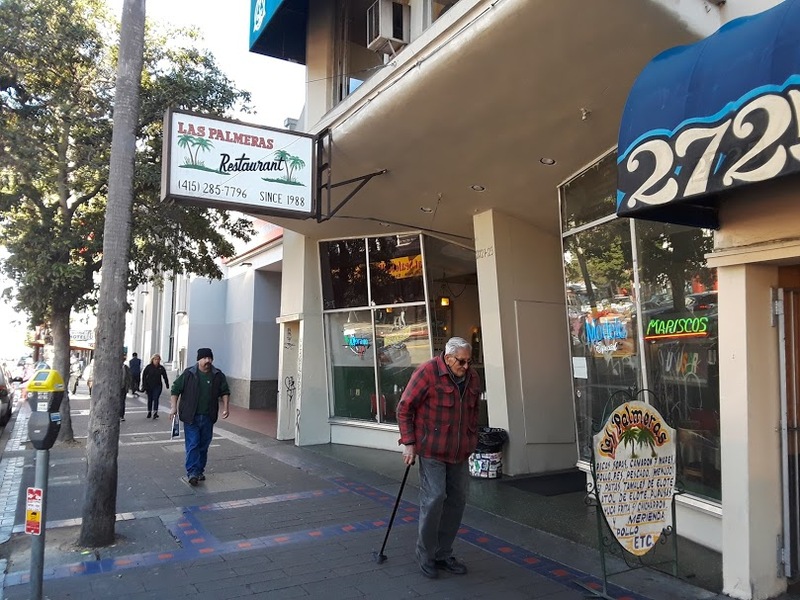 I’ve been walking by Las Palmeras for years — 13, to be exact. But they’ve been around for 30 — since 1988! 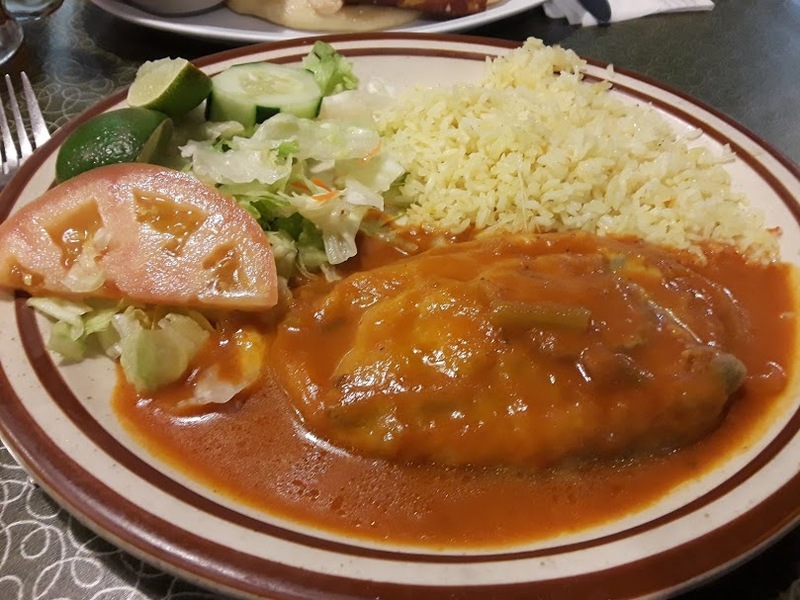 It is an old school, Salvadoran-family-owned restaurant and, on any given day, you can walk by the big picture windows and see people slurping up bowls of their renowned sopa de res (beef soup). The décor is casual and simple — a few Frida Kahlo/Diego Rivera prints here, a crucifix and some pottery there — but the booths and banquettes are the old-fashioned, red-vinyl kind that take you back to another time. 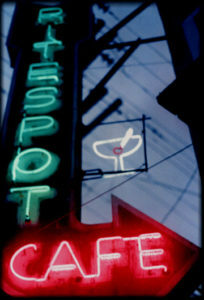 They serve Salvadoran specialties as well as Mexican food. Holy cow! The broth was super beefalcious, richly flavorful, with a good hunk of beef. Full of veggies, too — the zucchini was particularly good. Such a huge serving, as is typical. I managed to eat down about a quarter inch of this baptismal font, and the rest came home with us. Or flautas, as they’re known here. I thought they came a la carte, but they arrived with rice and beans. The beef inside was a bit tough, but tasty. 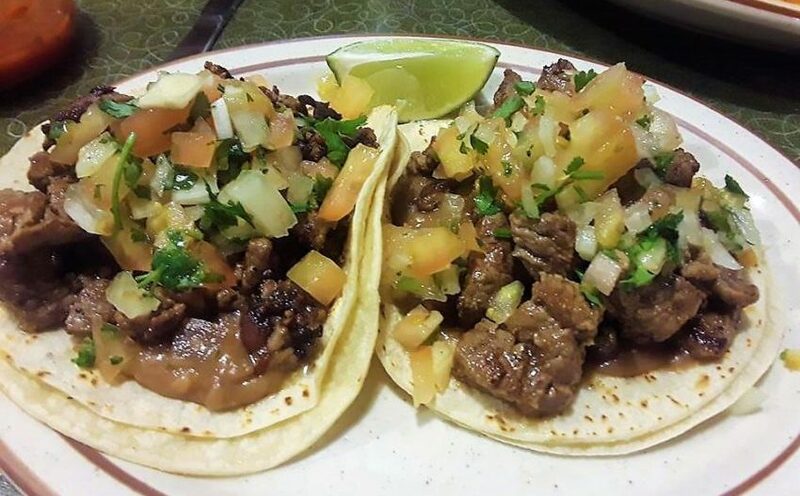 I love the taste of freshly fried tortillas — so much corny goodness emanates from a dish like this. The rice, unfortunately, was some of the blandest rice I’ve ever had in a Mexican restaurant, which is a crying shame. The beans were good, but I was sad that the guacamole mentioned on the menu for my flautas was nowhere to be seen. Instead, they came with crema and a tomato sauce, but I used the salsa to drown all my sorrows. 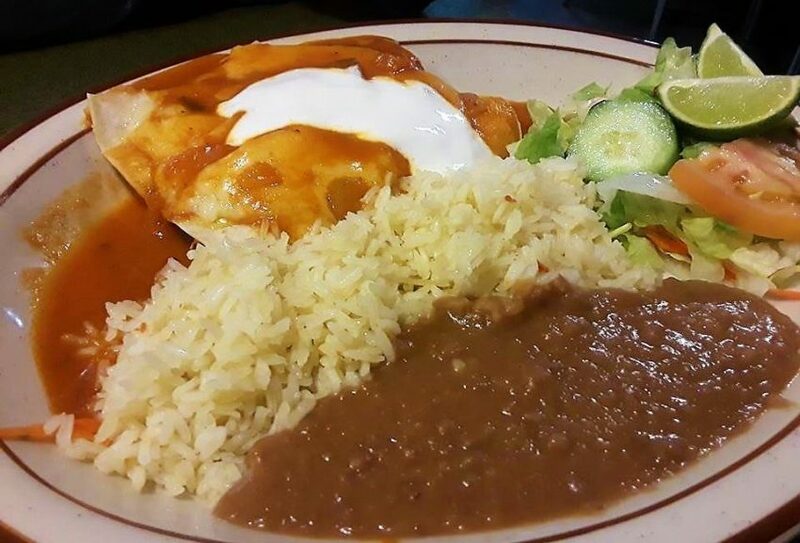 It came with the same rice, but the enchilada was wonderful, with very tender chicken. He also ordered two carne asada tacos (because I refused to let him order a burrito) and they were great. Really nice char on the steak, hefty slices. These would have been enough for a meal, so while the price-per-taco may be high, you definitely get your money’s worth. On our second visit, we both knew what we were going to get. Pupusas! Seriously? Maybe the best ones I’ve had yet. Who knew? We had the loroco-and-cheese and the chicharron-and-cheese. The chicharron here was more like shredded pork than ground, and so much more flavorful than others I’ve had, with a very pleasing texture. Their curtido was a tad less tangy than others, which was OK by me. 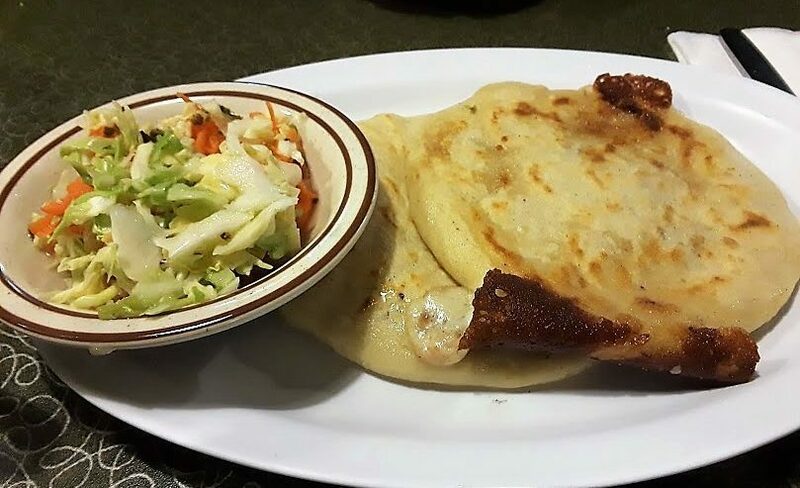 This will definitely be our go-to for pupusas from now on. 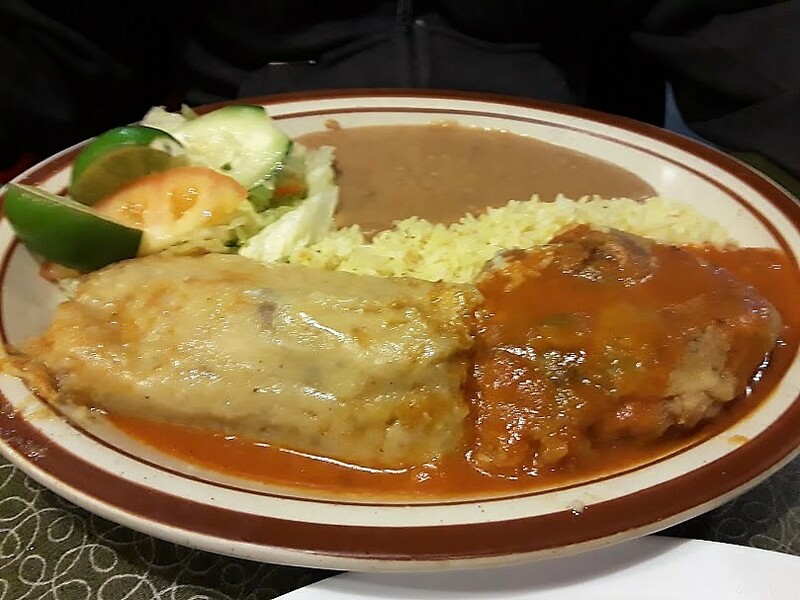 Chile relleno y tamale de pollo. 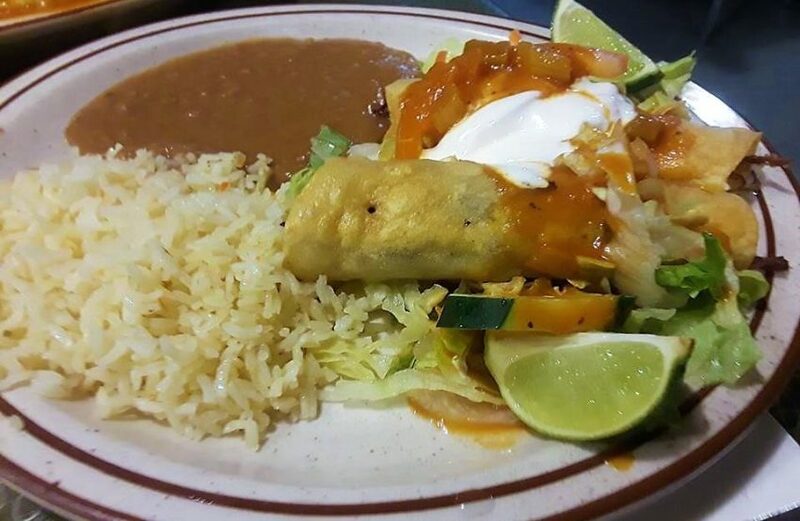 A chile relleno with ground beef — rather mild-tasting but good — and a delicious chicken tamale. Salvadoran tamales are the most tender, in my opinion, and this one was no exception. Unfortunately, that rice was no fluke: it was still quite forgettable on this second visit. Ejotes are green beans, I learned (they’re called quite a few different things in other Latin American countries) and, instead of being stuffed, which would be all but impossible to do, they are laid side-by-side, enveloped in cheese, then battered and fried, with a tomato sauce poured over them. The sauce had a very herby flavor to it that I couldn’t identify — unusual. But good! For all the assaults to our sensibilities that we are exposed to daily in the Mission, it’s gratifying to see a family business like this hold its ground. 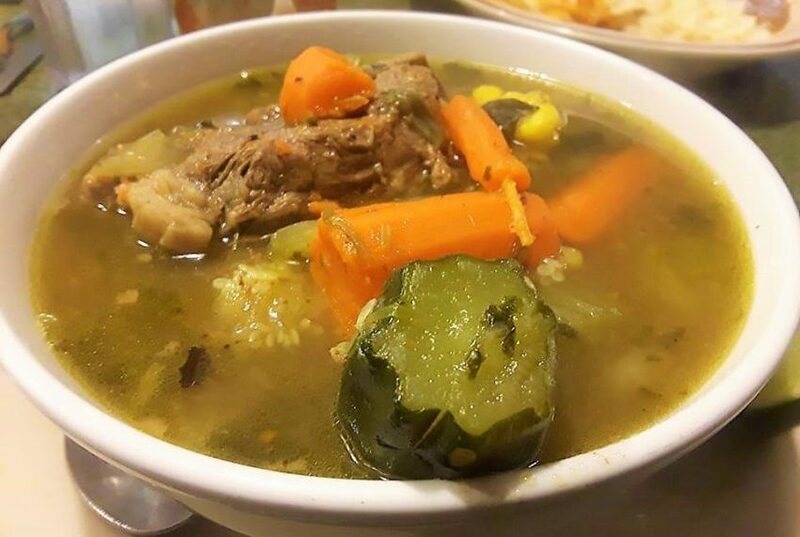 The menudo soup or they call it sopa de patas which is made of beef shanks, beef feet, tripe is super delicious! It’s kind of the Mexican menudo but instead of using pork feet they go cow 😋 I love both recipes by the way.